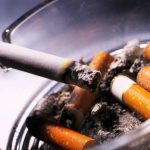 A politician in the Italian-speaking canton of Ticino wants an end to smoking outside in public spaces. In addition, she would like smoke-free areas in outdoor parts of restaurants. Nadia Ghisolfi, a member of the Christian Democratic People’s Party of Switzerland (PDC/CVP) in Ticino, has called for several smoking bans and a change to smoking rules in outside areas of restaurants. She wants a ban on smoking in playgrounds, bus stops, train stations, and public buildings. In addition, she would like to see smoking and non-smoking sections on the terraces of restaurants. Smoking outside is already banned in some countries. For example, some states of Australia have banned it in outdoor dining areas, children’s playgrounds and beaches. In 2004, a municipal council in Sydney banned smoking on beaches, outdoor dining areas, children’s playgrounds, and within 10 metres of council properties. Since March 2007, the only public outdoor places smokers may light up in the municipality are are some footpaths and roads. 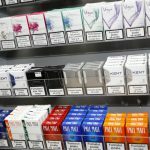 In Australia, tax increases are expected put the price of an average packet of cigarettes up to $40 (CHF 30) by 2020. In Switzerland, the price is around CHF 8.50. Making the habit expensive and inconvenient seem to be working. Smoking rates in Australia are 13%, compared to around 20% in Switzerland. In the UK, laws and discussions on outdoor smoking bans are moving forward. A sign outside a building entrance at Canary Wharf in London shows new anti-smoking laws in action. 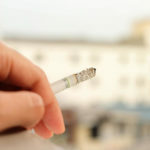 One of the main arguments for such bans is the health damage smokers impose on innocent bystanders forced to share public spaces, such as building entrances and train platforms. Smoking sign in Canary Wharf, London. 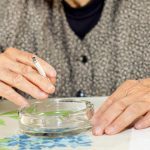 When it comes to Swiss smoking restrictions, Ticino has a reputation for being the canary in a smokey coal mine. It was the first Swiss canton to ban smoking in restaurants. A vote in 2006, banned it – 79.1% voted in favour. An informal poll taken by the newspaper Le Matin on Facebook, shows a clear majority in favour of banning smoking in public spaces. 57% said yes, 3% were undecided and 40% were against it. Perhaps a popular vote on the issue would clear the air.